This holiday commemorates the fall of Barcelona in the hands of the Bourbon troops during the War of Spanish Succession on September 11, 1714, after fourteen months of siege. 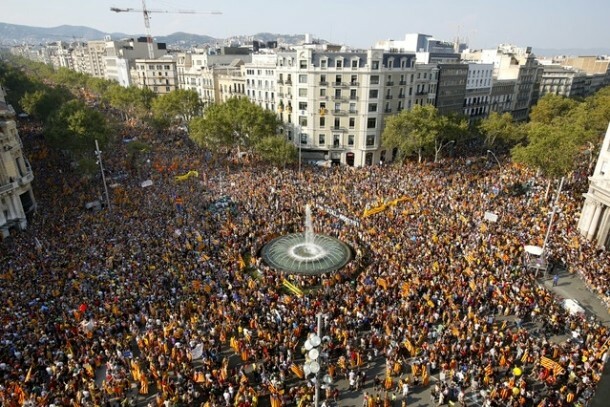 The Catalan Parliament declared September 11 as the National Day of Catalonia, “La Diada” and there are programmed several events for the day. The city is planning to receive more than 400,000 visitors, taking part in the acts. If you are arriving on this day, keep in mind that it will be a difficult day regarding transportation, and the city will be full up. We never recommend taking the train from the airport on normal days and even less so, on a day like Sep 11, pickpockets will take advantage of the crowded trains. The best way to get into the city is taking the Aerobús, that will take you to Plaça Catalunya, final stop, were you should hop-off. … or your best bet, our bizFlats Airport Transferhttp://www.bizflats.com/en/services/barcelona-airport-transfers-car-hire-corporate-and-limo-transportation.html “from the plane to your apartment – your hassle free arrival. You are arriving on a very special day with lots of people on the streets, so get ready for this festive occasion, and observe all the logical security measures regarding your cameras, wallets, purses, phones, etc., as you will do in any other place of the world which is heavily crowded. Be prepared and enjoy your trip!